Srinagar, July 19 (KMS): In occupied Kashmir, the Jammu and Kashmir Salvation Movement (JKSM) has strongly condemned the detention of two real brothers, Merajuddin Mir and Shabbir Ahmed Mir lodged in Kathua and Baramulla jails from year 2015 and 2017 respectively. Srinagar, July 19 (KMS): In occupied Kashmir, the High Court Bar Association (HCBA) has condemned the brutalities of Indian troops in Mochwara area of Shopian district. The HCBA spokesman in a statement issued in Srinagar said that the Indian forces personnel barged into the houses of civilians and assaulted the inmates and damaged the properties without any reason. Srinagar, July 19 (KMS): In occupied Kashmir, the Chairman of Jammu and Kashmir Muslim Conference (JKMC), Shabbir Ahmad Dar has said that Jammu and Kashmir is an internationally recognized disputed territory. Srinagar, July 19 (KMS): In occupied Kashmir, the president of Cable Operators Association, Amjad Noor has warned shutdown if ban on channel was not revoked. 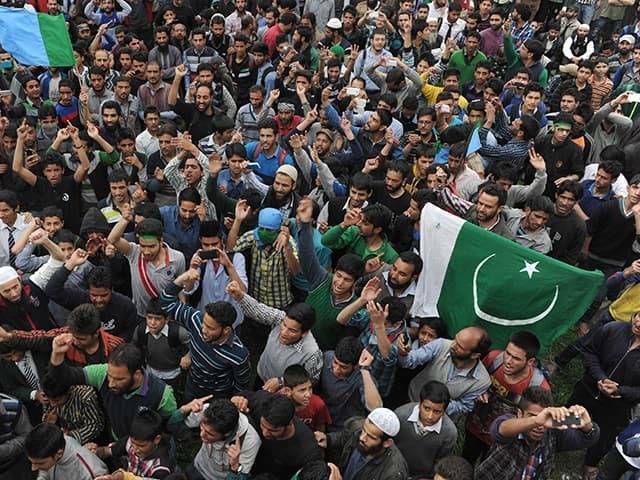 Srinagar, July 19 (KMS): Kashmiris on both sides of the Line of Control and across the world are observing the Accession to Pakistan Day, today, with a renewed pledge to continue the struggle for freedom from Indian occupation and complete merger of Jammu and Kashmir with Pakistan. It was on this day in 1947 that the Kashmiris adopted a historic resolution from the platform of the All Jammu and Kashmir Muslim Conference in Srinagar, demanding accession of the state of Jammu and Kashmir to Pakistan in accordance with the Partition Plan, two-nation theory and the aspirations of the people of the territory. Srinagar, July 19 (KMS): In occupied Kashmir, the family of a Pulwama man illegally detained under draconian law, Public Safety Act (PSA), expressing concern about his deteriorating health has said that the jail authorities are denying medical care to him.